Historian James Truslow Adams popularized the phrase, “American Dream” in his 1931 book Epic of America. The American Dream means different things to different people but it is mostly used in connection with achieving financial freedom through hard work. Achieving the American Dream is a goal of business owners all across the United States. The dream of a successful business that provides a stable and prosperous life for the owner, employees, and their families. In order to achieve this these days a business must have a solid marketing strategy, which can cost a lot of money and cripple a small business. The solution to this is the banding together of businesses and their community in mutual support of each other, all Supporting The American Dream! You sign up for the service and purchase one (or more) of our low priced packages. These packages get you guaranteed likes, comments, shares, etc. on your business’ social media posts, pictures, and more by actual, local individuals in your area. These individuals are compensated, by us, for interacting with your businesses through likes, comments, shares, etc. This gets you quality, word of mouth advertising in your local community. 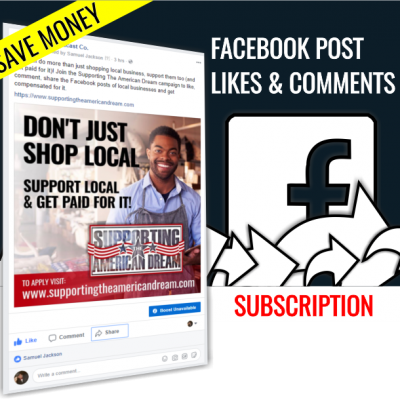 All individuals in the program are all thoroughly vetted to ensure they are indeed local to your area and that they have a robust, active social media presence. 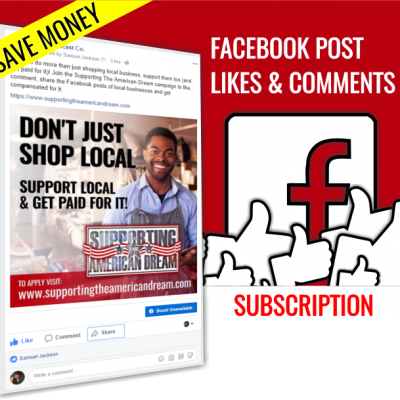 The first benefit you receive after purchasing your first package is getting a like/follow of your social media page from our members that are in the program, in your area! This will give you an instantaneous boost to your business’ social media page! Then you just designate what posts/pictures/videos/etc. you want liked and commented on or shared each month. Then you just sit back and watch your social media page explode with new views! 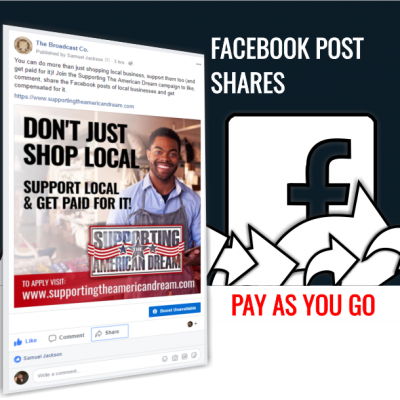 You will receive quality likes and comments or shares from vetted local people who also hold sway over all of their local friends/family giving your message a further reach and effective delivery. There is no better advertising then having one of your friends tell you about a local business and that is just what this program gives you! HOW DO YOU JOIN THE CAMPAIGN? Just purchase the package(s) you want below and you are set! We will contact you to get information and counsel you on what posts, pictures, videso, etc. to sponsor as well as inform all of our members to go and like/follow your page! There is no commitment, no hidden fees, and no problems. You will be billed on the same day as when you purchased your first package and you can cancel/suspend your service at any time just by sending us an email or giving us a call. This campaign’s purpose is to help you achieve your American Dream. JOIN US AS AN INDIVIDUAL OR BUSINESS/ORGANIZATION AND ACHIEVE YOUR AMERICAN DREAM! 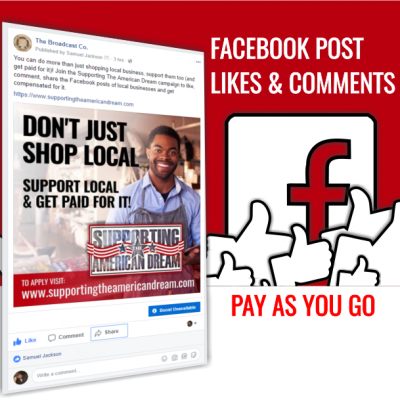 The Supporting The American Dream campaign is built to benefit the local business/organization and individual, at the same time, while giving them the opportunity to help each other. If you still have questions please feel free to contact us using the form below. Are You An Individual or Business/Organization? The Supporting The American Dream campaign is developed and maintained by The Broadcast Co.